1. Thanks to Jen at Runner_Maybe I got an invite to the Mezamashii Run Project. If you haven't heard of it yet Mezamashii is the Japanese word for eye-opening, or brilliant. The Mezamashii Run Project is Mizuno's quest to deliver a more brilliant running experience to dedicated runners everywhere. They are giving away thousands of running shoes. I had a really hard time picking a pair out, but finally settled on these the Wave Precision 12's. I could have gone with the 13s but they were very PINK and I wasn't sure I could handle really pink shoes. Wave Precision 12 Capturing the simplistic purity and beauty of Japanese Block Printing, the ultra lightweight Wave Precision 12 offers a phenomenal running experience. Soft yet durable blown-rubber forefoot outsole design for cushioning and flexibility. I think they are pretty and can't wait to try them out soon when I get back to running. They are a performance neutral shoe so I will wear them for races and speedwork. 2. 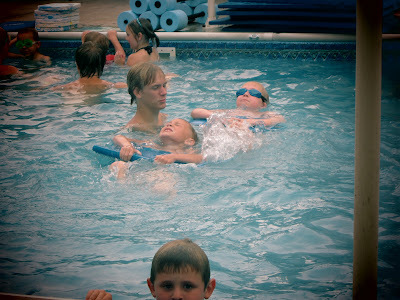 My kids have been doing swim lessons and it has been so fun to see how they progress from year to year. They have a half hour lesson four days a week for two weeks. Then they are taking two weeks off and I signed them up for another session. This is supposed to be a picture of my son, but the little guy at the bottom totally photo bombed it. and the little miss looking pretty fierce! I got the Mizuno Inspires and I don't think they were the right choice for me, so I'm kind of bummed. I hope you love yours! That's awesome on the free new shoes! That photobomb cracked me up! The shoes look very nice. I like the colors. I'm never able to find cute shoes with colors like that. Sorry to hear of the fires. It is extrelely dry here as well and we have had several fires in the Sandhills. Free shoes are good! I wouldn't look good in pink Though:). I miss the good ole days of swim lessons, your kids will thank you for the rest of their lives for teaching them how to swim! Love those shoes! 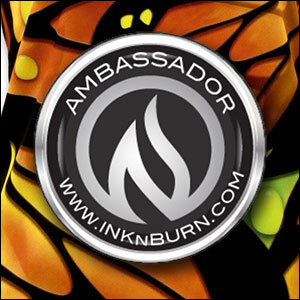 How do I get an invitation!? 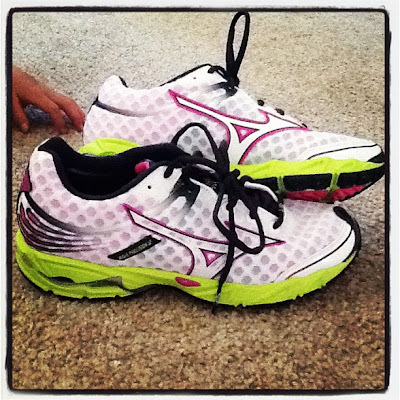 Have you tried Mizunos before? Sorry to hear about the fires - we're praying for rain here also. My Wave Precision 13s came today! Oooo...they are very pink, but super, super cute! Hope you get rain soon. Yes, the fires are just horrible this year. We have the same sense of dread with lightning here. I'm looking forward to fall. I admit, seeing that it's just a hair darker at 5 a.m. now when I get up to work out has been reassuring. I like the shoes, so pretty and apparently a great shoe from what I hear! 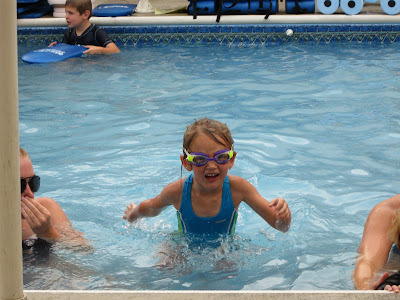 LOVE the pics of the kiddos in the pool. Ahhhhh, summer! Praying for all you guys up there and everywhere. It is so sad how dry everyone is. I hope you get lots of rain soon. Stay safe. Very cool you got the invite!! I am hoping mine goes through one of these days but who knows! I am with you on rain and fire scare. Last week we got up to 107 and this coming week is all 100, its not my favorite summer at all. Hopefully the country gets a nice soaking soon because it is needed. That is awful that fires can happen so quickly and losses are happen, its very sad for everyone involved. Wave Precisions are awesome! I hope you like them. Praying for rain for you. 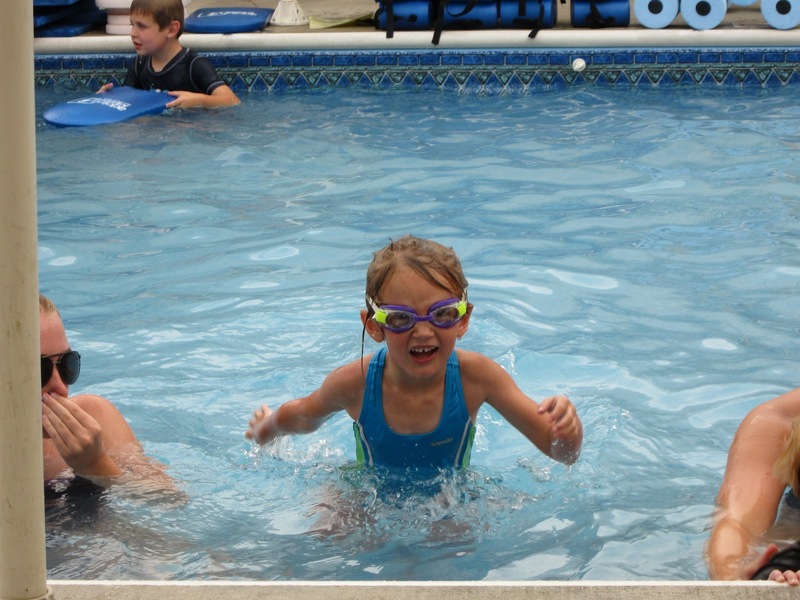 I like the Mizunos you picked and the kids look like they had a blast at the pool. My heart breaks for the farmers too. Most people don't realize that in a fire these people can lose their entire income for the year if their crops or livestock are destroyed. Sorry to hear about the fires. I will say a pray for your area to get some rain. I'm so glad someone else does not like pink shoes either. My shoes right now have pink acents, however they fit the best so I bought them. I still hate the fact that they are pink lol and can't wait until I can get new shoes hehe.